Mohandas aka Birbal was a famous minister in Akbar's court. Akbar was a great Mughal Emperor who enjoyed asking tricky questions to his courtiers and getting witty / wise answers / solutions from Birbal. The stories of Akbar and Birbal are enjoyed the most by the readers of all age groups. 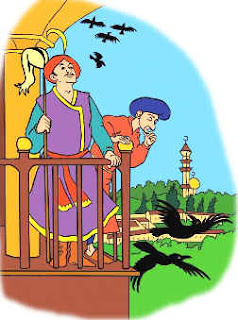 Here is one such witty story about the population of crows in Akbar's kingdom. Read and enjoy. On a pleasant morning Akbar and Birbal were enjoying a walk in the Royal Garden. The emperor was delighted on seeing the beautiful colorful flowers, the greenery all around and the chirping of birds. Mother Nature was at her best and Akbar along with Birbal was enjoying the morning walk. While Akbar was lost in his own world, he noticed a flock of crows in the garden. Suddenly a tricky question flashed in his mind and as always he wanted to test the cleverness of Birbal by questioning him. "I just wonder how many crows would be there in my kingdom", said Akbar. He then turned to Birbal and asked, "Birbal, do you think you can answer this question?" After thinking for a while, "Jahanpanah, there are ninety-nine thousand, six hundred and eighty nine crows in your kingdom", said Birbal. Akbar was amazed at the quick answer and questioned him, "How do you know this?" "Jahanpanah, you can get the crows in your kingdom, counted", replied Birbal without hesitating. Birbal gave a spontaneous reply, "It means that the rest of the crows have gone on a vacation to visit their friends and relatives in the neighboring kingdom". "And if there are more crows than what you mentioned.....? ", questioned Akbar. "Then the crows from the neighboring kingdoms have come to your kingdom to visit their friends and relatives", replied Birbal. "Hahaha!, in fact you are clever Birbal. I am very much pleased with your answer," said Akbar and laughed heartily. Moral: Think and try to give a reasonable / convincing answer.